Cedar loves: adrenaline. She loves the feeling of falling. She likes to be thrown very high into the air, slung onto my back for wrapping, spun in circles, and playfully frightened. She has mastered one of the playground slides and can go up the stairs and down the slide by herself (982 times). She’s a big fan of food and pretty much eats all day long. 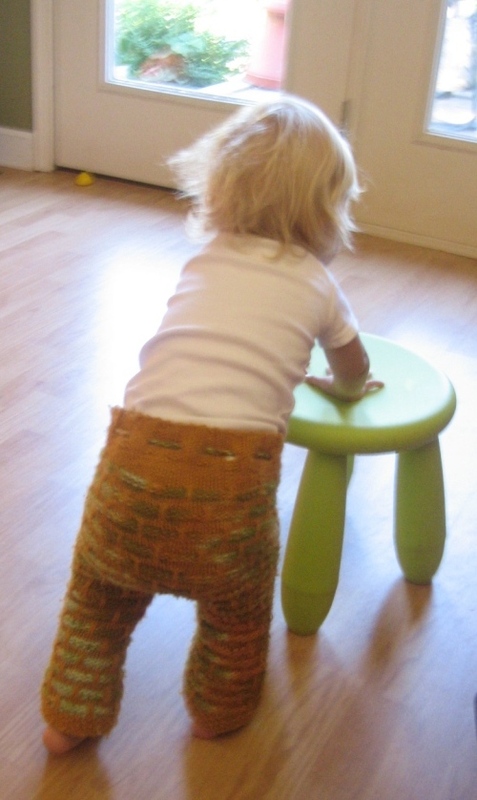 And last week, she learned to tote stools around to reach high places. A whole new world of mischief opened up. Cedar hates: baby containers. She screams in terror when placed in contraptions. No playground baby swings, kelty backpack carriers, wagons, strollers, most high-chairs, etc. I’m not sure why it is so scary to her. She loves being worn in close-to-the-body carriers. She hates when I leave her and she is very suspicious about it. When we arrive at new places, there is clinging and digging in of fingernails until she is convinced I’m not leaving. Then she’ll run from me and find something (dangerous) to explore. Mommy struggles with: her velociraptor scream. shopping with Cedar–it is impossible. Her refusal to stay with anyone other than Scott without screaming. Her hair. 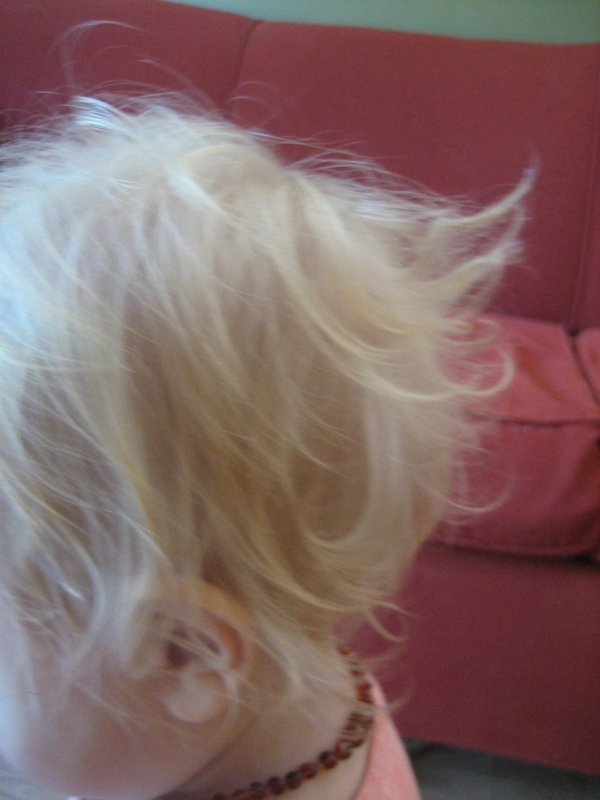 We’re talking CRAZY matted up hair. Cedar also removes her diaper. Any chance she gets. She has four teeth. But considering her nursing frequency (addiction) these past few days, I would guess another is on the way. Her favorite toys: cell phones, dress-up items, dolls, my dishes. She likes to squat over small containers and pee on them (see above item about removing her diaper). So we bought her this potty. So far, no success with that. 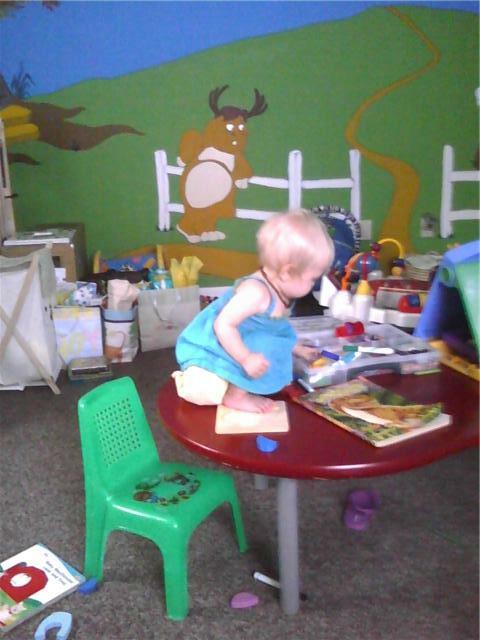 Here she is standing on a table with diaper half-off playing with markers. This was around 11 months. Danger+bare bum+mischief=success! She is a doll. Love her hair!! She’s going to make a great boater! I hope Ivey and Cedar get to play soon at a babywearing meeting. Maybe they are old enough now that they wouldn’t try to violently wrestle each other? They have a lot in common. Ivey has what my brother calls the pterodactyl scream. 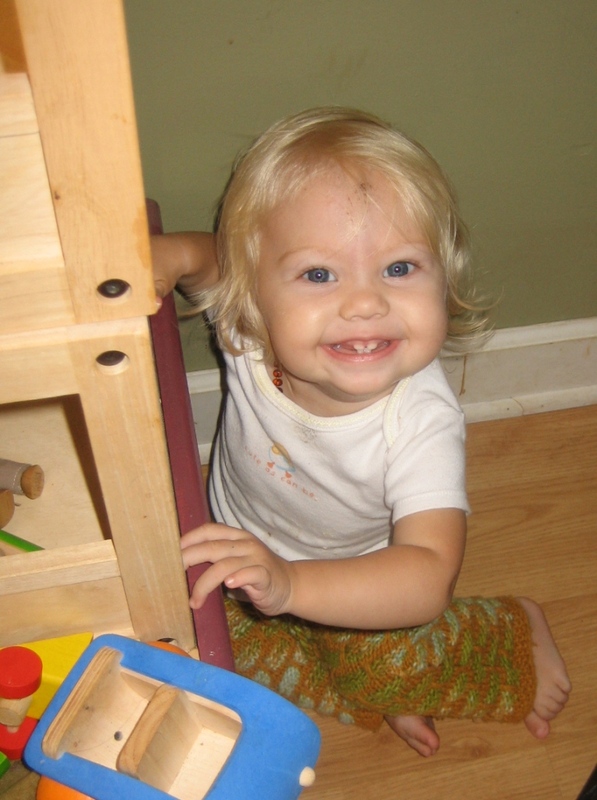 She also likes to climb up on tables and we frequently find her in a position similar to the one in the bottom photo. That is cool that she sings a song. Ivey recently started singing “lalalala…” We bought a Baby Bjorn Little Potty but it is seriously little! She prefers her regular Baby Bjorn potty and has done quite well with it, and the other one stays in the van for traveling. Jenny, that little potty is indeed seriously tiny. She likes to use it as a hat. She has the best smile in the world! Love her!!! Another mountain expedition guide in the making!